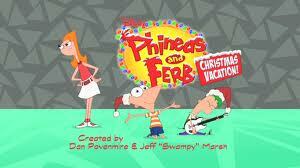 In addition to being longer than any of the previous episodes, this also has the distinction of being the first episode of Phineas and Ferb that doesn't take place over summer vacation. Not surprisingly, they've animated a special opening, which is basically a winterized-parody of the norm. The first half of the episode basically plays out the same way almost every episode is structured. The second half then throws out the formula when things go horribly wrong. I'm actually a little torn on this. On one hand, this special is exceptionally clever: there are some brilliant moments and jokes. On the other hand, the pacing feels off to me. The series's quick pacing and high energy is a big part of what makes it successful. This special fails to maintain that, and as a result drags at times. Likewise, there are a lot of songs here, and the majority fall well below the series's normal level of quality (though Dr. Doofenshmirtz's song about his motivation is a welcome exception). In addition, some of the fantasy elements seem out of place here. The Christmas elves look like they walked out of a different cartoon and clash with the show's established design scheme. It's also questionable whether Christmas elves belong in this world at all - while it's not entirely consistent, Phineas and Ferb occupy a world that's almost entirely science fiction in nature; these are somewhat tone-breaking. But none of that takes away from the humor of this special, nor does it detract from its heart. This is funny, sweet, and intelligent. While some elements feel out of place, they're still well executed. And while most of the music doesn't live up to the series's expectations, it's certainly not bad. In addition, this special gets better the more you think about it. I've actually seen this twice, because I couldn't make up my mind whether to label it "Highly Recommended". One scene, which first seemed like a missed opportunity to incorporate a Christmas trope, I now believe to be an intricate subversion of that same trope. Likewise, the more I consider the ending in relation to the series as a whole, I find myself wondering if this special may have been conceived as a shockingly complex theological exercise (or I could be reading way too much into it). Regardless, this is a very good Christmas special. The fact it failed to live up to my expectations says more about the series than this special as a stand-alone story. I am, therefore, recommending this... just not as highly as I'd recommend the rest of the series.